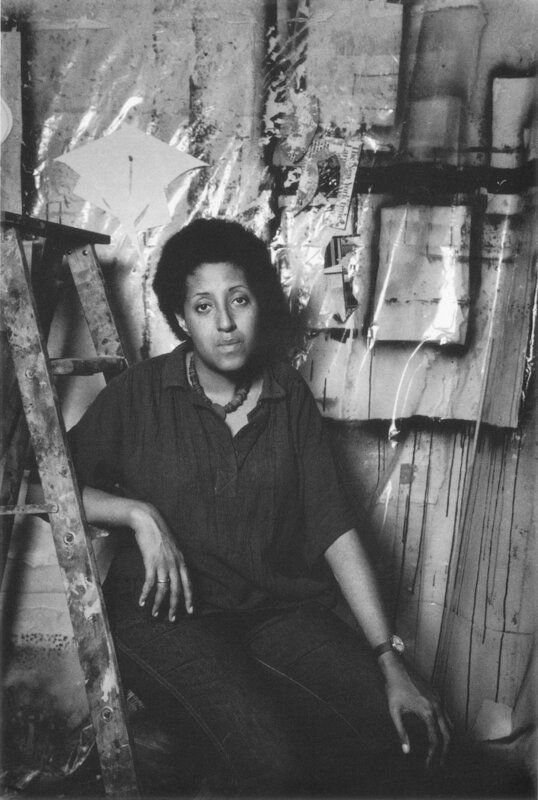 Born in Philadelphia in 1943, Howardena Pindell studied painting at Boston University and Yale University. After graduating, she accepted a job in the Department of Prints and Illustrated Books at the Museum of Modern Art, where she remained for 12 years (1967–1979). In 1979, she began teaching at the State University of New York, Stony Brook where she is now a full professor. Throughout her career, Pindell has exhibited extensively. Notable solo-exhibitions include: Spelman College (1971, Atlanta), A.I.R. Gallery (1973, 1983, New York), Just Above Midtown (1977, New York), Lerner-Heller Gallery (1980, 1981, New York), The Studio Museum in Harlem (1986, New York), the Wadsworth Atheneum (1989, Hartford), Cyrus Gallery (1989, New York), G.R. N’Namdi Gallery (1992, 1995, 1996, 2000, 2002, 2006, Chicago, Detroit, and New York), Garth Greenan Gallery, New York (2014), and Spelman College Museum of Fine Art, Atlanta (2015). Pindell often employs lengthy, metaphorical processes of destruction/reconstruction. She cuts canvases in strips and sews them back together, building up surfaces in elaborate stages. She paints or draws on sheets of paper, punches out dots from the paper using a paper hole punch, drops the dots onto her canvas, and finally squeegees paint through the “stencil” left in the paper from which she had punched the dots. Almost invariably, her paintings are installed unstretched, held to the wall merely by the strength of a few finishing nails. The artist’s fascination with gridded, serialized imagery, along with surface texture appears throughout her oeuvre. Even in her later, more politically charged work, Pindell reverts to these thematic focuses in order to address social issues of homelessness, AIDs, war, genocide, sexism, xenophobia, and apartheid. Howardena Pindell’s work has been featured in many landmark museum exhibitions, such as: Contemporary Black Artists in America (1971, Whitney Museum of American Art), Rooms (1976, P.S. 1 Contemporary Art Center), Another Generation (1979, The Studio Museum in Harlem), Afro-American Abstraction (1980, P.S.1 Contemporary Art Center), The Decade Show: Frameworks of Identity in the 1980s (1990, New Museum of Contemporary Art), and Bearing Witness: Contemporary Works by African-American Women Artists (1996, Spelman College Museum of Fine Art, Atlanta). Most recently, Pindell’s work appeared in: We Wanted a Revolution: Black Radical Women, 1965–1985 (2017, the Brooklyn Museum, New York), Energy/Experimentation: Black Artists and Abstraction, 1964–1980 (2006, The Studio Museum in Harlem), High Times, Hard Times: New York Painting, 1967–1975 (2006, Weatherspoon Art Museum, University of North Carolina, Greensboro), WACK! Art and the Feminist Revolution (2007, Museum of Contemporary Art, Los Angeles), Target Practice: Painting Under Attack, 1949–1978 (2009, Seattle Art Museum), Black in the Abstract: Part I, Epistrophy (2013, Contemporary Arts Museum, Houston), and Painting 2.0: Expression in the Information Age, (2015–2016, Museum Brandhorst; 2016, Museum Moderner Kunst). Pindell’s work is in the permanent collections of major museums internationally, including: the Brooklyn Museum; the Corcoran Gallery of Art; the Fogg Museum, Harvard University, Cambridge; the High Museum of Art, Atlanta; the Louisiana Museum of Modern Art, Copenhagen; the Metropolitan Museum of Art; the Museum of Contemporary Art, Chicago; the Museum of Modern Art; Museum of Fine Arts, Boston; Museum of Fine Arts, Houston; the National Gallery of Art, Washington, D.C.; Pennsylvania Academy of the Fine Arts, Philadelphia; the Philadelphia Museum of Art; The Studio Museum in Harlem; the Smithsonian Museum of American Art, Washington, D.C.; the Wadsworth Atheneum, Hartford; the Walker Art Center, Minneapolis; the Whitney Museum of American Art; and the Yale University Art Gallery, New Haven.